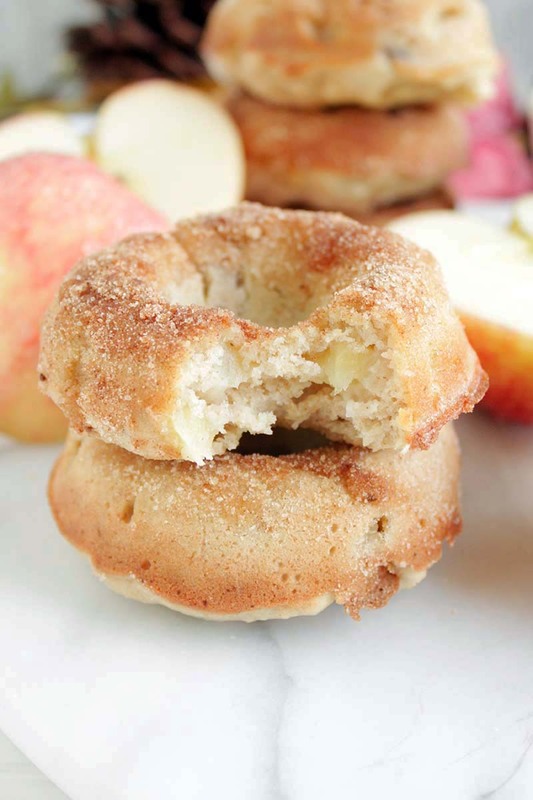 Studded with apples and walnuts, then topped with a cinnamon-sugar mixture, these homemade gluten-free doughnuts are the perfect fall treat! Preheat oven 425°F. Grease a doughnut pan with melted butter or cooking spray. In a medium mixing bowl combine flour, yeast, baking powder, salt, apple pie spice and ginger. Set aside. In a large bowl whisk together melted butter, apple sauce and sugar. Add in eggs and mix until combined. Whisk in milk until combine. Slowly stir in the flour mixture to the wet mixture until just combined, do not over mix. Using a spatula fold in apples and walnuts. Pour batter into a large piping bag or zipper bag and set on top of warm stove for 15-20 minutes to rise slightly. Snip corner of the piping bag and pipe batter into the doughnut pan. Place in oven and bake for 8-9 minutes. Melt topping butter and set aside. In a small bowl combine cinnamon, sugar and a pinch of salt. Brush doughnuts with melted butter and sprinkle with cinnamon-sugar mixture. Doughnuts are best eaten the same day.